BORLEY RECTORY - The Most Haunted House in England, 1863-1939. Official web site. The rectory was destroyed by fire in 1939. In presenting the following information, I make no judgement as to what is true, what is legend, or what is imagination. I have researched and gathered as much information as possible - pro and con. It is up to the reader to decide what to believe and what to discard. - "Son of Borley"
Copyright 1994-2017 by Vincent O'Neil. 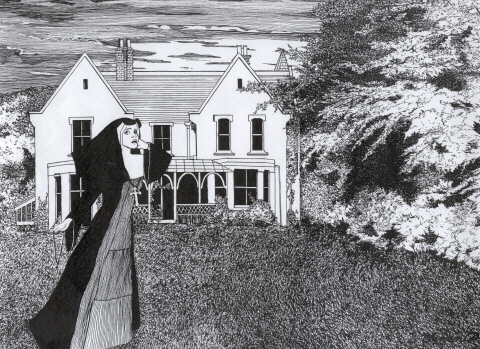 "Legend of the Borley Nun" artwork copyright 2001 by Barbara Clements, and used by permission. Original text, photographs, and graphics used throughout the various pages on this site are copyright 1994-2016 by Vincent O'Neil. All other photos, graphics, and texts copyright by their individual owners.